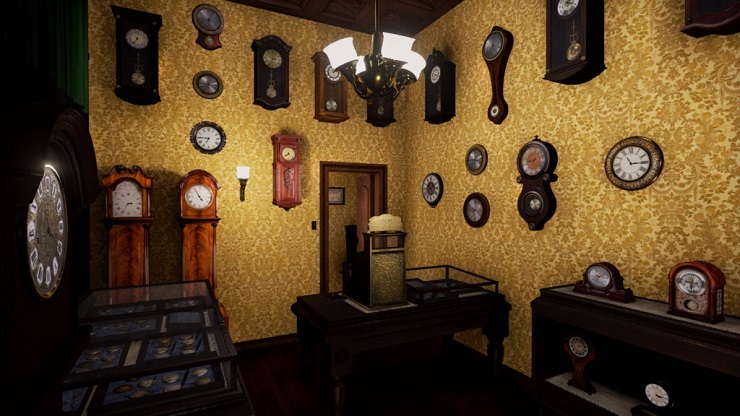 Waking the Glares is a first-person adventure game with puzzle elements, following the story of Downfall – that’s you – whose life has been turned upside down. The directive seems to be to piece together what exactly took place and restore the missing pieces. At the outset, the game is narrated by a melancholic man whose voice immediately reminded me of Dear Esther, setting out the tale before us. As you traverse through the fragmented and dream-like world, you’re faced with a number of puzzle elements to work your mind around. The first chapter is a quiet house on a snow covered street on the 24th of December. 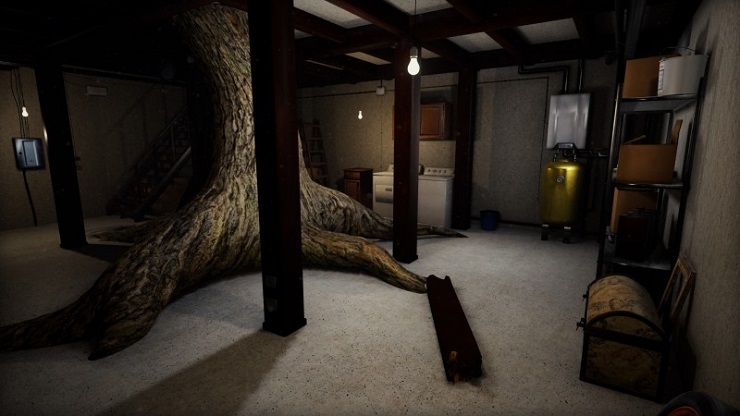 The house is brightly lit, but no-one is there, save a tree growing from the basement through the living area on the ground floor to the first floor. There is, so far as I could tell, no explanation as to why the tree was there nor its significance within the context of the game. The goal was, after some searching around and fumbling in the proverbial darkness, to give life to the tree and allow its branches to grow into the open and bloom flowers of brightly coloured petals. Why, we have yet to see. The second chapter is in a Parisian square with an array of buildings and bustling life all around, if indeed you can call it life. The inhabitants of this faux-Paris world are faceless, wooden artists’ mannequins dressed in the fineries of French high society. You are given a list of items to procure by any means necessary but still you do not know as to why you’re doing so. The note also plainly leads you to your starting block and sets you on your way to the first task. It is here that the puzzle elements open up to a wider scope, requiring you to not only solve some logic puzzles, but also to interact with the world around you. These become a series of scenarios to get the items on your list, all by stealing of course. Waking the Glares was a strange experience for me. The game was lacking a sense of agency or aids to embed me in the world or the narrative. Throughout the first two short chapters – which is all that is released at the time of writing this – I was trying to ascertain what exactly was going on while wondering what it was that I was supposed to latch onto. I didn’t feel that hook that would make me feel that I had a stake in this unfolding tale, nothing to urge me on further to discover what had befallen our protagonist. As an adventure game, Waking the Glares offers a unique glimpse into the mind of the creator. There’s a sense of stepping into that part of the creative mind and exploring that you often find with indie games. The vision shines through. As a puzzle game, however, the game is a little lacking. Clues and solutions were either obtuse or far too overt without much of a middle ground to stand on. It takes a certain finesse to get this balance right, but this is simply refinement and definitely something that can be iterated over should the developer decide to do so. The game is slated for seven chapters in total, with two released at the time of this review, so perhaps the story will become clearer as time goes on. What I found to be lacking here was enough of a breadcrumb or morsel to chew on as I played. A single thread is all it takes and those who are curious will keep pulling at it until the whole thing unravels. The first two chapters of Waking the Glares were very short at 55 minutes for both – fumbling and staggering around looking at everything included – and so there’s currently not a lot else to say about the game. While it didn’t hook me completely, with some refinement and a little more time this could be a really interesting title.